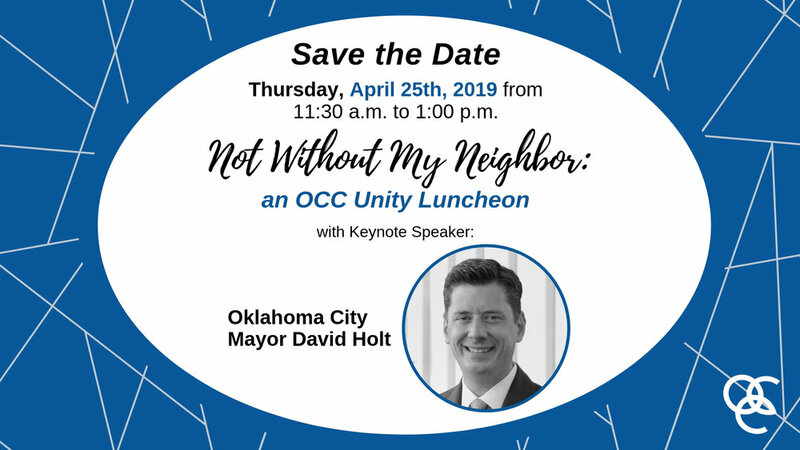 We are excited to welcome Mayor David Holt as our speaker for our Spring Benefit luncheon. We will gather and celebrate that we cannot thrive without our neighbors. We are interconnected and it's the inclusion of our neighbor and the diversity of this community that helps us to succeed. We hope you will plan to join us as we celebrate the mission of the Oklahoma Conference of Churches - connecting, motivating, and empowering the witness of faith communities and individuals throughout Oklahoma on issues of faith, care, and social justice. Come hang out with other supporters and partners of the Oklahoma Conference of Churches. Come hear from Rev. Shannon Fleck, Executive Director, about the vision of the future of OCC. 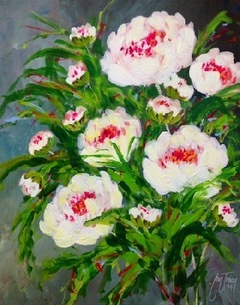 Come paint and have fun with other lovely, amazing people. Light snacks will be provided. Cash bar (wine & beer) will be available. All proceeds benefit OCC ministry. Join us for an evening of "Inspired Stories" as we celebrate the ministry of the Oklahoma Conference of Churches. We will join together to share stories of the past and present of OCC, as well as dream about the future of our ministry together. You, our partners, inspire the ministry that OCC undertakes on behalf of the people of Oklahoma. Come and be a part of sharing stories and connecting with your neighbors. Our 2019 Annual Dinner & Fundraiser speaker is New York Times Bestselling Author, Georgia Hunter. We Were The Lucky Ones by Georgia Hunter, is inspired by the incredible true story of one Jewish family separated at the start of World War II, determined to survive—and to reunite—We Were the Lucky Ones is a tribute to the triumph of hope and love against all odds. An extraordinary, propulsive novel, We Were the Lucky Ones demonstrates how in the face of the twentieth century’s darkest moment, the human spirit can endure and even thrive. Georgia will share with us what inspired her to follow her family's story and pursue the research of her history. We are excited to welcome Georgia to our evening of "Inspired Stories". We are grateful to Temple B'nai Israel - OKC and the Respect Diversity Foundation for partnering with us to bring this incredible speaker. We hope you will save the date, November 7, 2019, for this exciting event! An Interfaith Event which will assist faith leaders in recognizing and responding to Adverse Childhood Experiences (ACEs). An ideal training event for any individual or group who works with children or youth in houses of worship. The OCC Annual Dinner will be held on Thursday, November 8, 2018 at the Embassy Suites by Hilton Norman Hotel & Conference Center. New Sponsorship packages are available and attached HERE . Please consider sponsoring our largest fundraiser of the year as we continue our programs and further our reach throughout the state of Oklahoma by empowering, motivating, and educating communities on issues of faith and social justice! We will have drawings for exciting prizes throughout the dinner, recognize award recipients, and enjoy plenty of fellowship with one another. Come learn about new initiatives within current programs as well as new areas of focus. Our keynote speaker will be none other than the Rev. Lawrence Ware. Rev. Ware is co-director of the Africana Studies Program and Teaching Assistant Professor and Diversity Coordinator in the Department of Philosophy at Oklahoma State University. He is a contributing writer to Slate Magazine, The New York Times and The Root. He has been a commentator on race and politics for the Huffington Post Live, NPR, and TV One. Lawrence has taught and lectured across the country on issues ranging from race to economic policy. He organizes the Critical Conversations series, which hosts a number of events on campus related to race, gender, and religion. . Please come hear from an amazing speaker, writer, leader, and civil rights advocate. We are implementing a new special on tickets this year! Early bird specials will go on sale beginning July 1, 2018 and will end on October 1, 2018 for $60.00! After October 1, tickets will be priced regularly at $70.00 and the deadline for ticket purchases will be November 1, 2018. Tickets ARE available for purchase below or on our 2018 OCC Annual Dinner page! For more information on the Annual Dinner, new sponsorship packages, or tickets, please contact the Director of Development & Finance, Courtland Powers at cjpowers@okchurches.org or call (405) 525-2928.